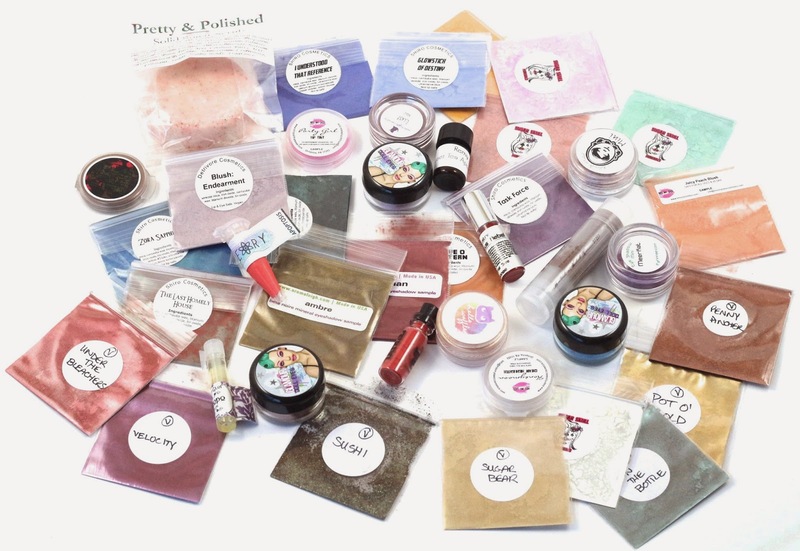 This is a very special edition of Indie Weekends, as I received a jam-packed package of indie pretties in the mail, and I'm here to review and swatch everything I received! And I even managed to do a few looks with some of the shadows! I revealed it all in an earlier post which you can find here, and it also includes some more information about our indie potluck. Warning! Extremely picture heavy post! I decanted all the sample bag products into 5g jars I purchased from TKB Trading, they are the same jars both Shiro and Glamour Doll Eyes uses, but I also got sifters with them, which Shiro uses as well. All eyeshadow swatches done over Too Faced Shadow Insurance primer unless otherwise noted. 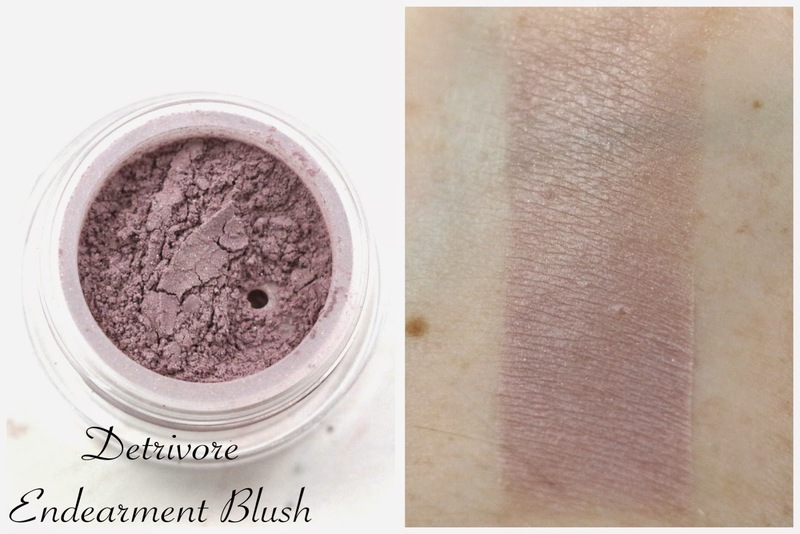 Detrivore Blush: Endearment - "Matte greyed lavender." The top half of the swatch is blended out, and the bottom half is patted on heavily. I don't know if I would look good with this as a blush, but it might work on my skin tone as a contour color. And it is eye and lip safe so it could be used as an eyeshadow or lip color. Blended out, it also looks like it could work as a face highlight. 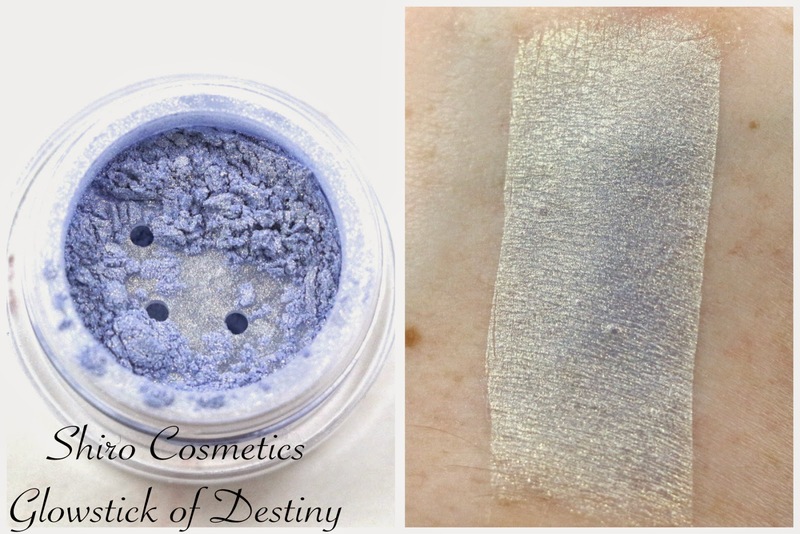 Shiro Cosmetics Glowstick of Destiny - "Muted Tesseract blue with strong golden duo chrome." This duo chrome is mostly the golden shade, but if you tilt it just the right way, you can see the light blue. You can see it a little on the right side of the swatch. But you have to be at a really steep angle to see it as the all over color. 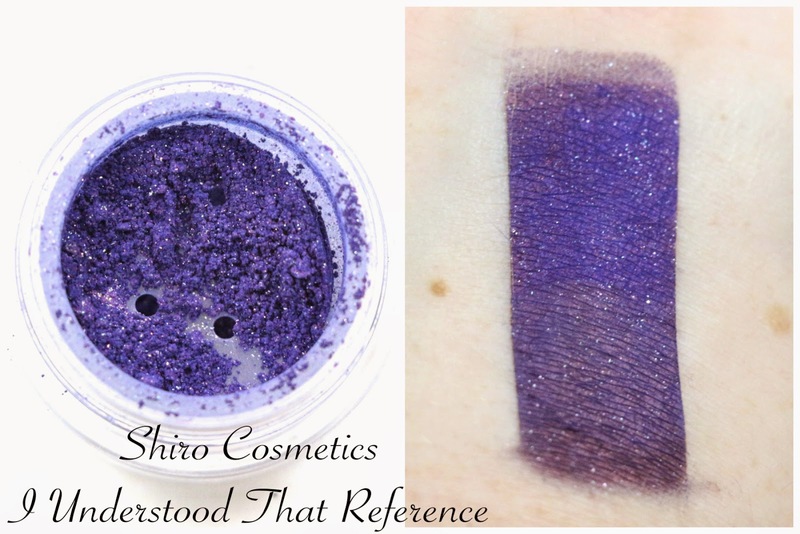 Shiro Cosmetics I Understood That Reference - "Deep patriotic blue with red duochrome and subtle white sparkles." The top part of the swatch is patted on heavily, and the bottom part is blended out. You can see that if you cake it on heavily, it's a royal purple color, and blended out it turns into a metallic dark purple color. I really like this shade, I can't believe I didn't get it earlier. 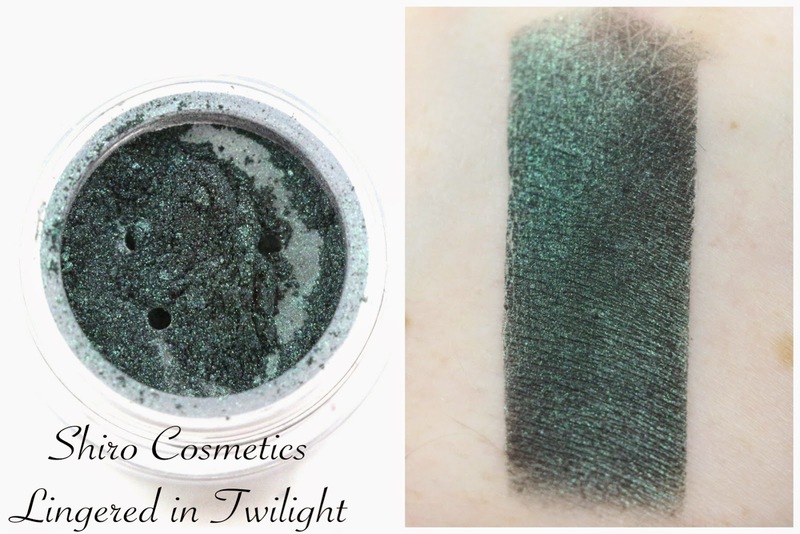 Shiro Cosmetics Lingered In Twilight - "A twilit forest: blackened blue and green tones with slightly metallic shimmer." This shade is a dark forest green, with a little bit of a shimmer. I also love this shade, I don't think I have a color in my collection that is this same shade. I have been so into dark shades lately, that I'm glad I got this color! 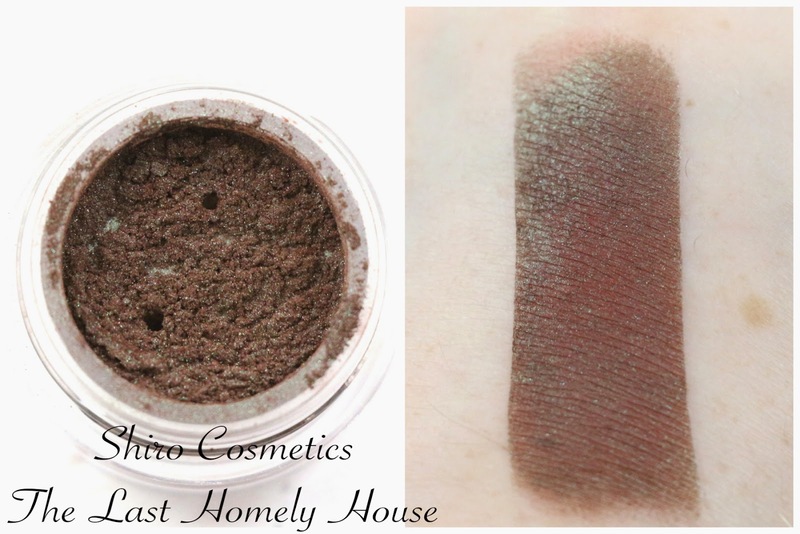 Shiro Cosmetics The Last Homely House - "A rustic cabin tucked deep in the woods: reddened brown with strong forest green shimmer." This looked more like a reddish-orange brown to me with the green shift. You can see the shift in the upper left corner of the swatch. 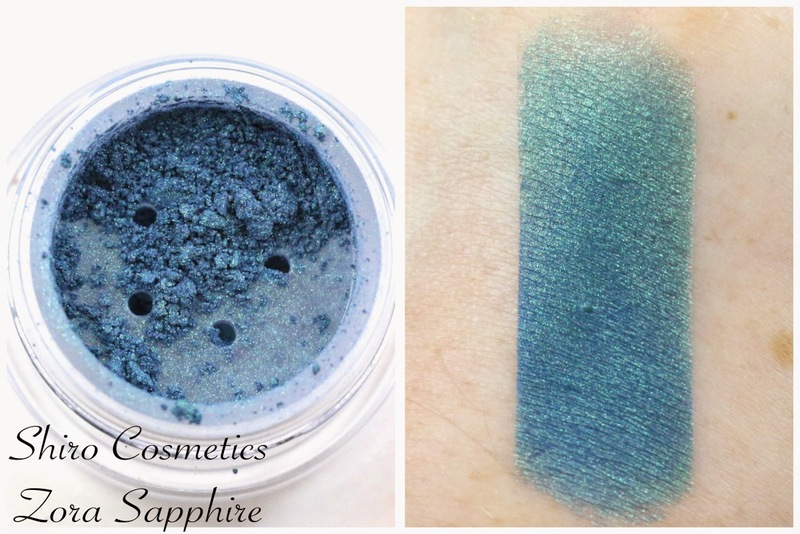 Shiro Cosmetics Zora Sapphire - "Deep teal with very strong green shimmer." I started swatching this, and was thinking to myself "ohmygod it's mermaid blue!" It has the perfect tropical ocean blue color with the green and golden shift/shimmer. Ugh I want to lay by the pool with this on my lids. Or be a mermaid for Halloween. One of the best mermaid shades I've seen. 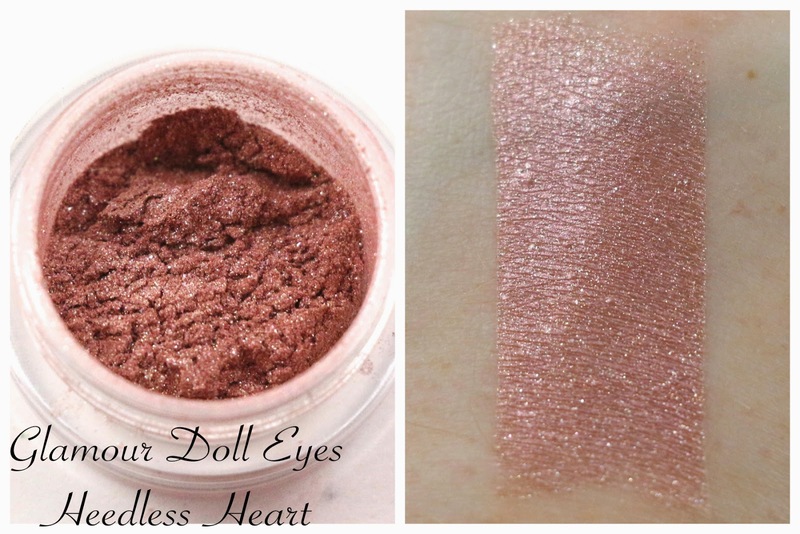 Glamour Doll Eyes Heedless Heart - "Heedless Heart is an almost metallic rose gold." This is a perfect rose gold shade, and even though I don't wear as many neutrals as I used to, this is a good one for a more formal look. 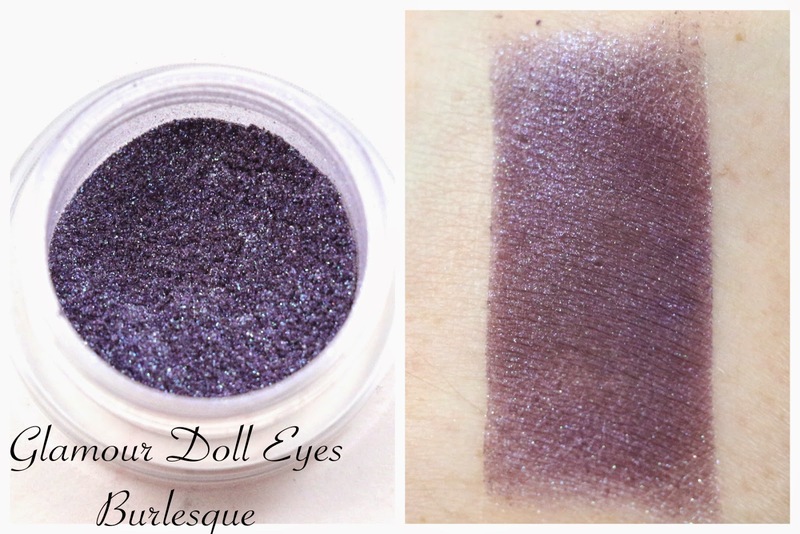 Glamour Doll Eyes Burlesque - "Burlesque is deep shimmery purple with blue and green sparkles." Another shade I really like, Glamour Doll Eyes has a lot of purples, and all of them, this one included, are all so pretty! 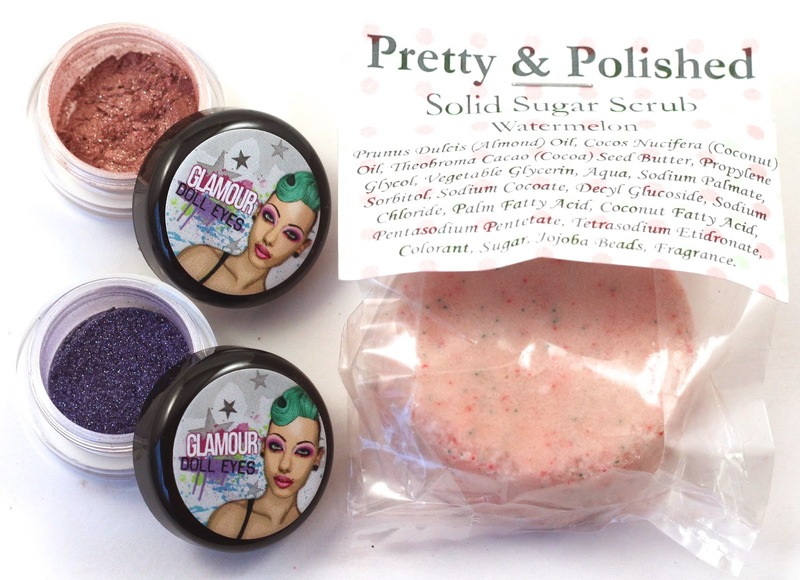 Pretty & Polished Watermelon Solid Sugar Scrub - "The watermelon scent is strong and fresh and sure to give you sweet thoughts of summer!" This sugar scrub is really abrasive. Like pumice stone abrasive. The scent doesn't really come through when you use it, and it does actually lather a little, but for feet, this scrub is perfect. The rest of your body? Not so much, it feels like rubbing large grit sandpaper all over your body. So, if you have/get one of these, I would recommend using it for your feet only. Aromaleigh Ambre - "Rich deep golden olive brown with highlights of pink." When I was shopping for an olive green color, I was looking for a very particular shade, and this is it. It's right on, I actually already ordered a full size jar of this shade. 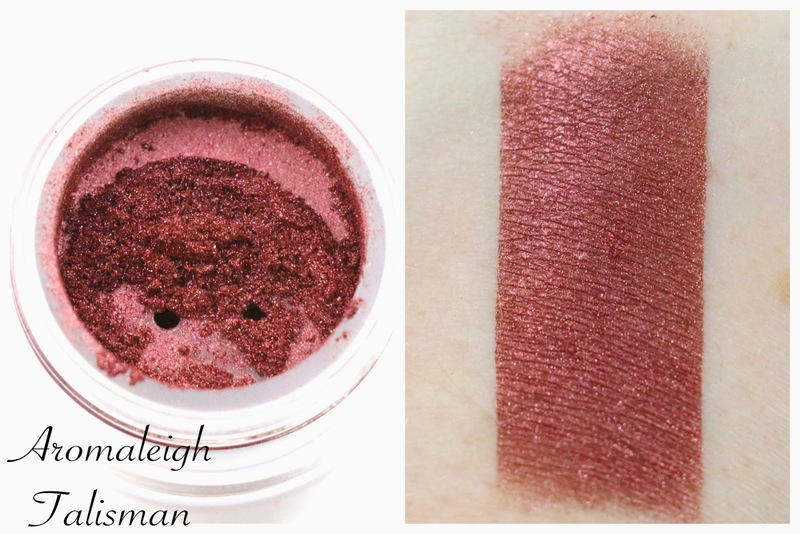 It has pink sparkles, and a subtle golden sheen, and it pairs perfectly with Talisman. 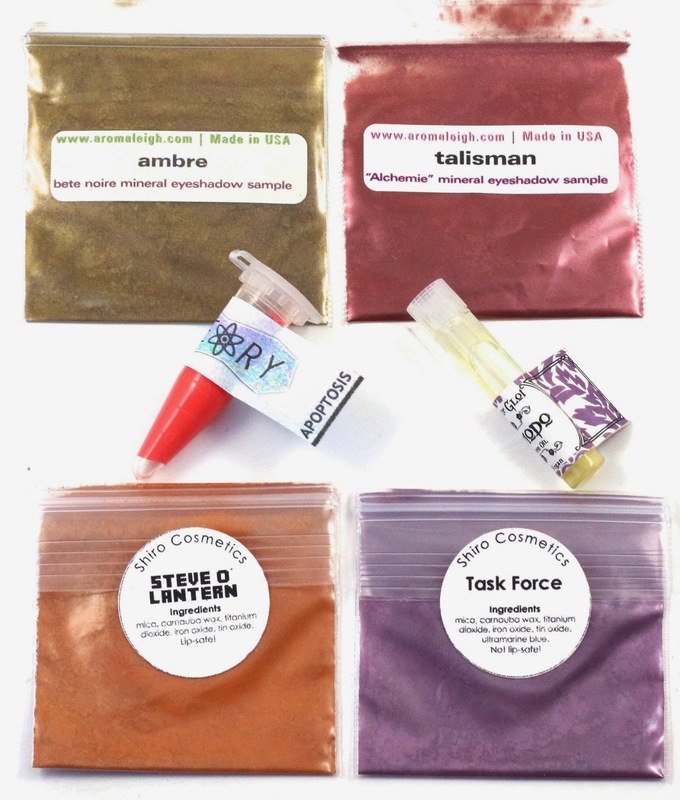 Aromaleigh Talisman - "Talisman is a deep, vivid burgundy with smoke undertones and a brilliant red luster." 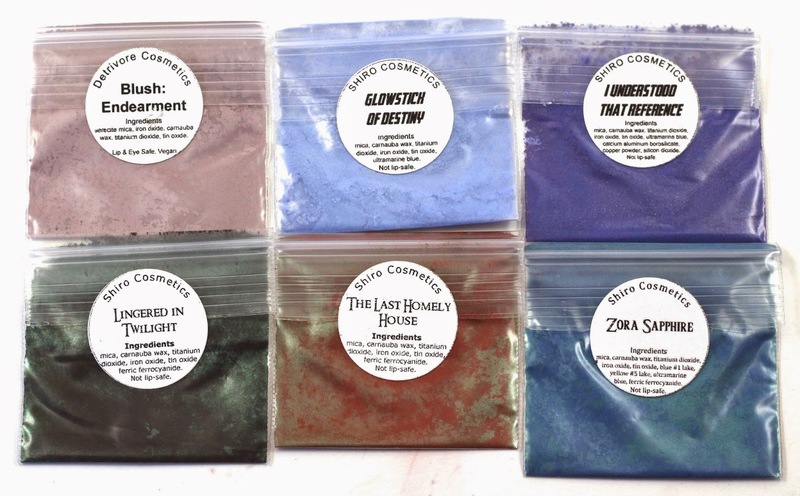 Aromaleigh Superstition - "Superstition is a deep indigo purple shade with sparkles of blue and garnet." Talisman got a little faded in this photo, I had originally put this on, took photos, then left the house for lunch with B. Then when we got back I looked at the photos and realized I didn't like any of them, so I retook them several hours later. I touched it up a little on the lid, but forgot the waterline. The inner corner and brow highlight is the Kiss My Sass Honeymoon highlight also featured in this review. Aromaleigh Talisman in the crease, and Aromaleigh Ambre on the lid. Haus of Gloi Komodo perfume - "Mangosteen, Tahitian vanilla bean, dragons blood resin and faded tropical blooms." I've reviewed this perfume before in this post, but I think this is a great fruity scent for almost anyone. 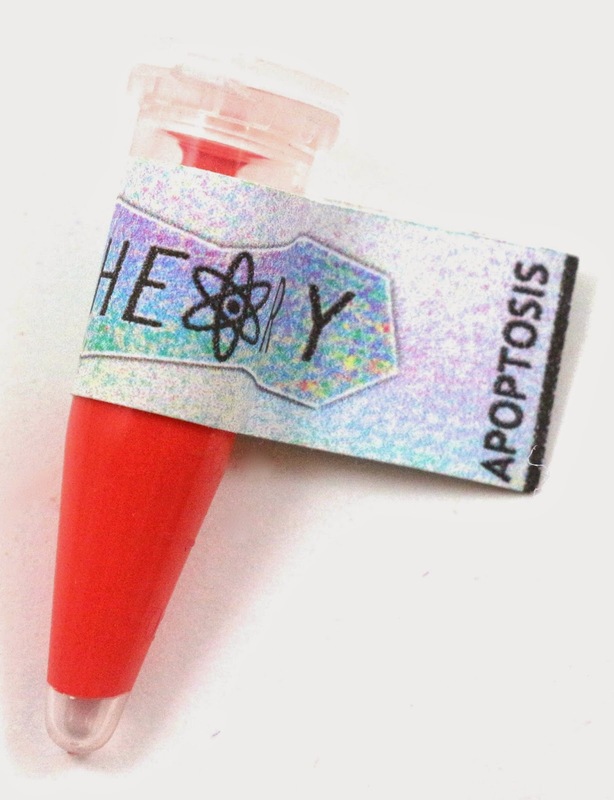 Life's Entropy Lip Theory in Apoptosis - "A vibrant, medium orange coral." This looked a tiny bit more orange than I had anticipated, but I still love the color. I didn't get a chance to wear it for very long, so I can't attest to the staying power, but I love the texture. It's almost matte without being drying, and it was opaque and pigmented. I would definitely recommend any of the Lip Theories to lip product lovers. 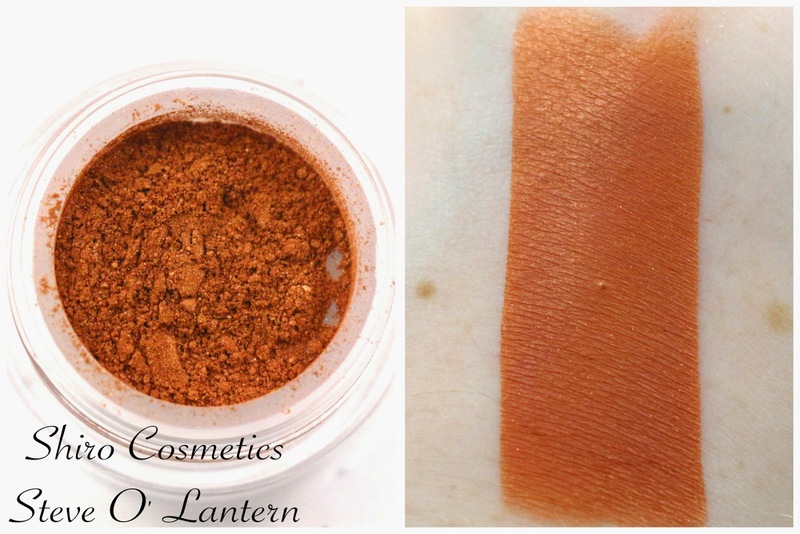 Shiro Cosmetics Steve O'Lantern - "Medium pumpkin-orange with metallic gold highlights." I was hoping when I picked this shade that it would be more coppery, but it's definitely more of a pumpkin orange. Perfect for fall and halloween. And I wanted to pair it with Task Force. It's a burnt orange with not much sheen. 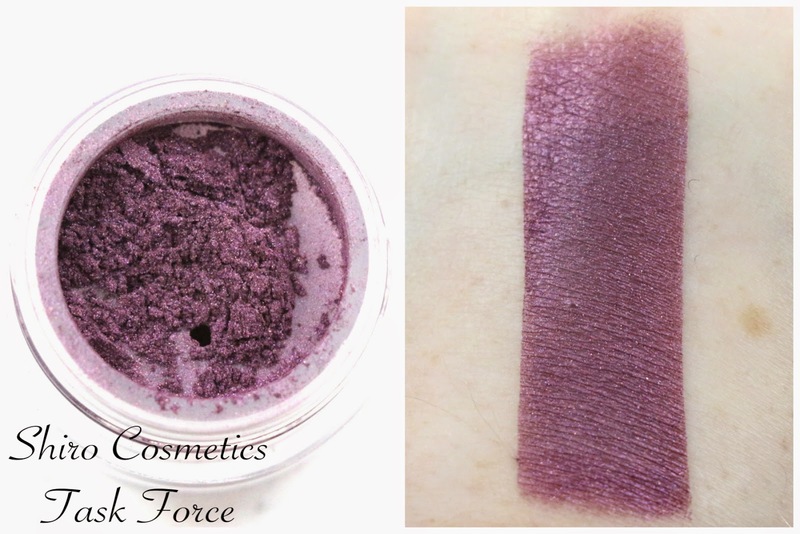 Shiro Cosmetics Task Force - "Shimmery deep red-toned purple." I wanted to find a dark reddish purple shade to go along with the orange shade I picked, and I finally settled on this shade. It's very creamy, and very pigmented. Shiro Cosmetics Steve O' Lantern on the lid, and Task Force in the crease. 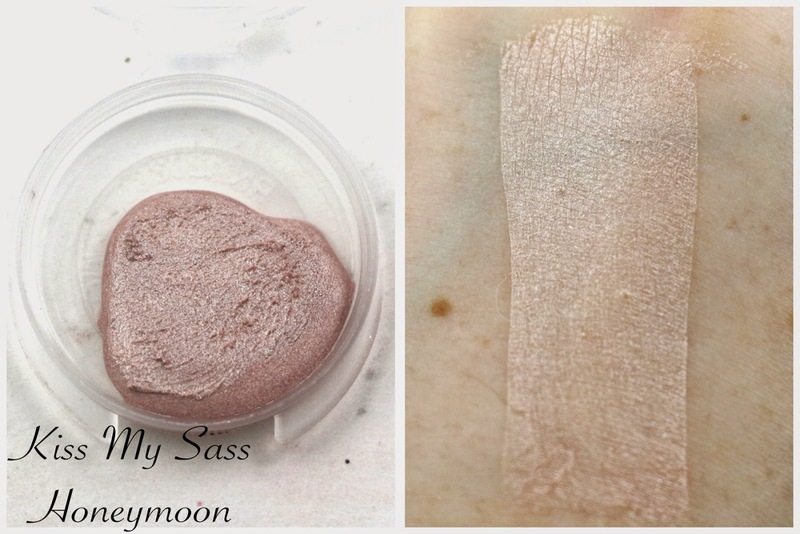 Kiss My Sass Honeymoon cream highlight is under the brow, and in the inner corner. 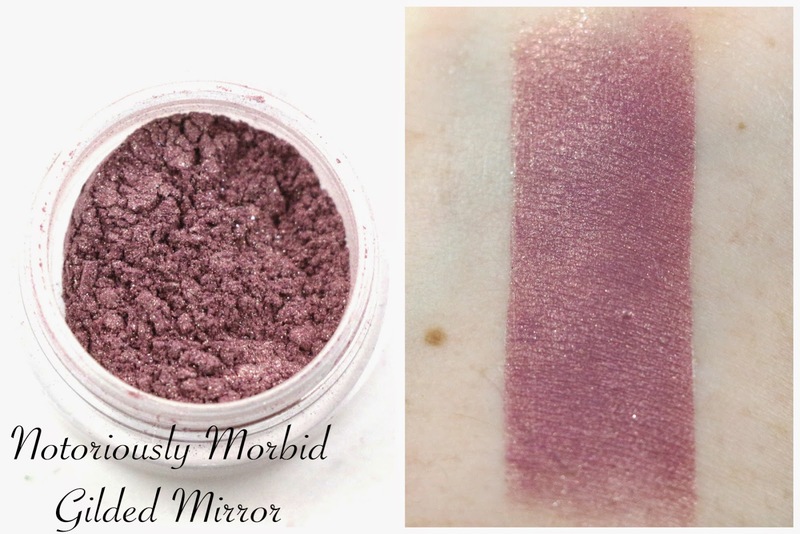 Notoriously Morbid Gilded Mirror - "A plum/mauve base with an airy gold overlay." I really love the description of this shade because it's spot on. The gold sort of sits on top of the shadow, instead of being blended in. It's a very beautiful color. 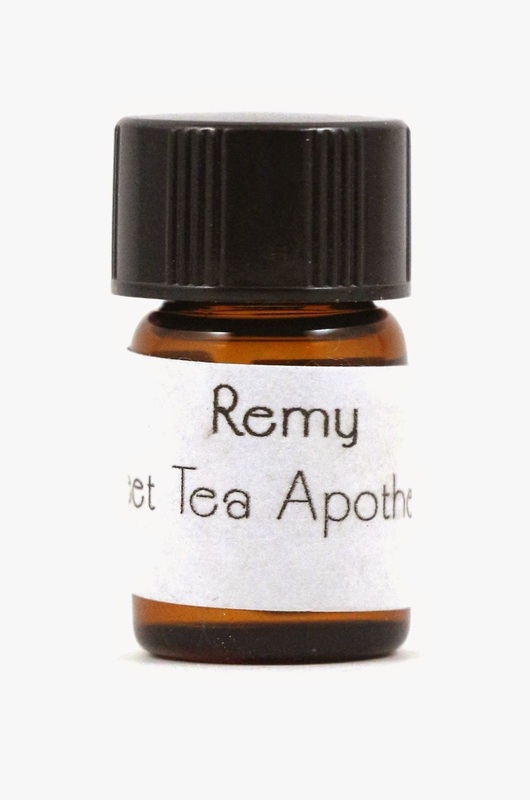 Sweet Tea Apothecary Remy perfume - "Notes: Saffron, Sandalwood, Honey, Lavender, Amber, Vanilla"
I loved this perfume, the staying power was amazing, 6+ hours on me, which I usually get about 3-4 out of most perfume oils. It's not too strong, feminine, without being heavily floral, and the sandalwood was the most prominent note after dry down. Eventually that gave way to the vanilla near the very end. 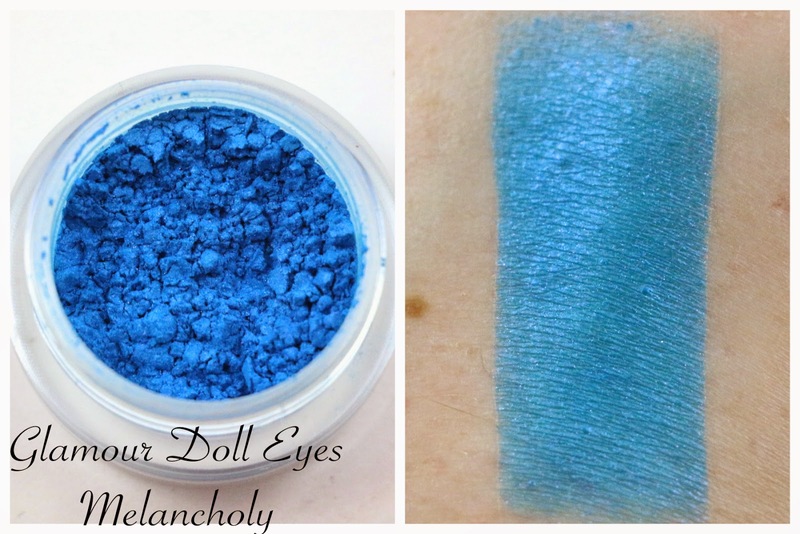 Glamour Doll Eyes Melancholy - *Discontinued* "Melancholy is a true blue color with low sheen." 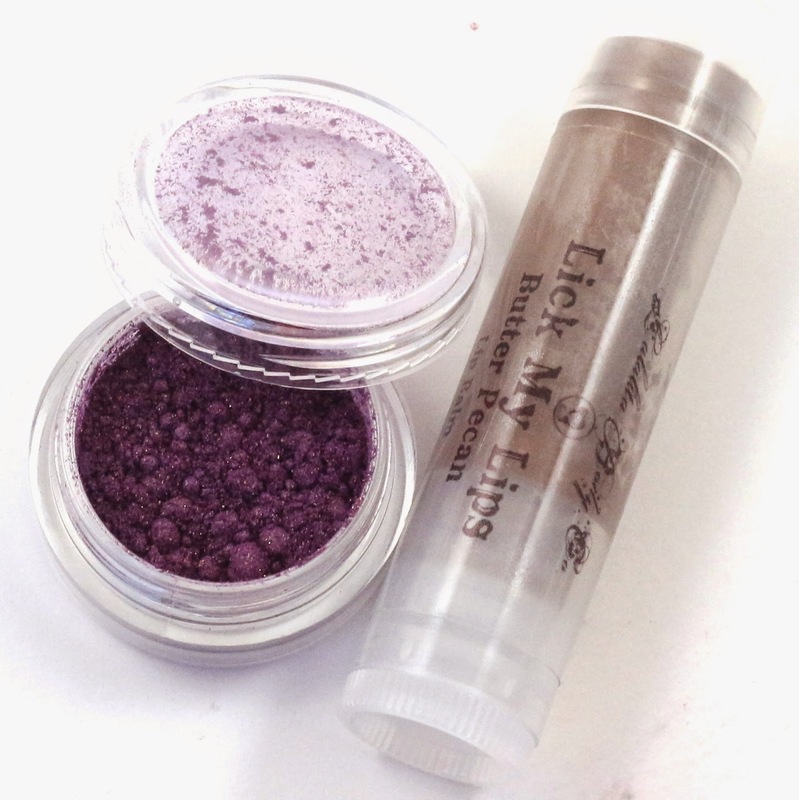 This is a discontinued shade, which I think is because it was an unblended pigment, but it is unique. It has a subtle sheen to it, and I think it would be great as an eyeliner color. 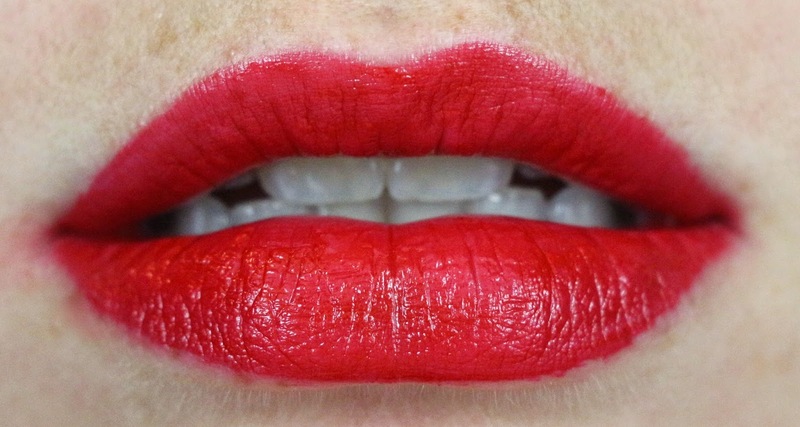 Fyrinnae Lip Lustre in Glamorous Rebel - "Bright, rich cherry red." Umm, why haven't I discovered these before now? 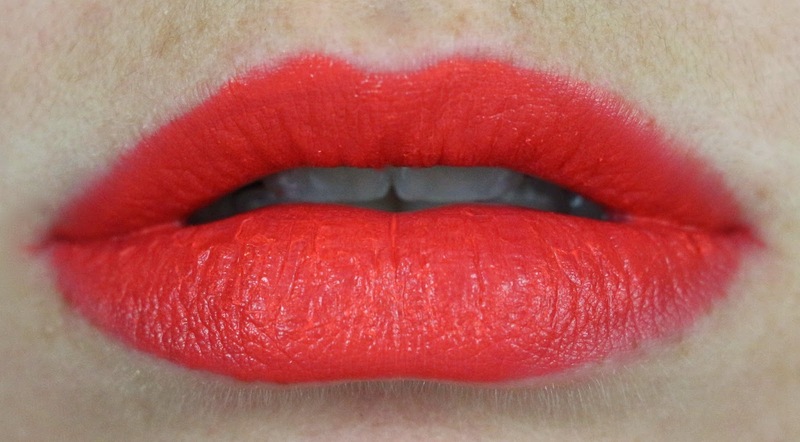 I want all the wearable shades now from the Lip Lustre line, and I love this red. The texture is like a creamy lipstick, but it applies with a wand. I have to say though, those were the most intense 2 minutes of my life trying to apply it perfectly for my swatch. And even then I still messed up a little, I have weirdly shaped lips. They aren't even, so rubbing my lips together to get even coverage doesn't work very well on me. 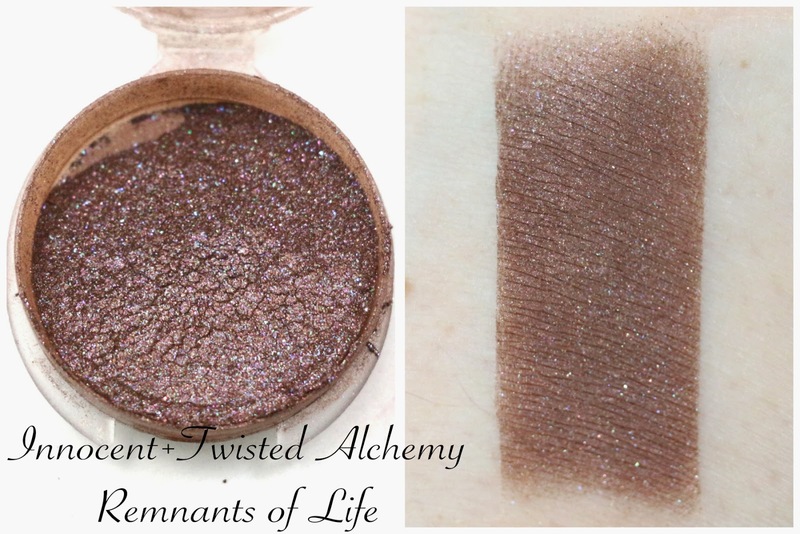 Innocent+Twisted Alchemy Remnants of Life - *Discontinued* "Remnants of Life is a chocolate brown with a rainbow of sparkles." 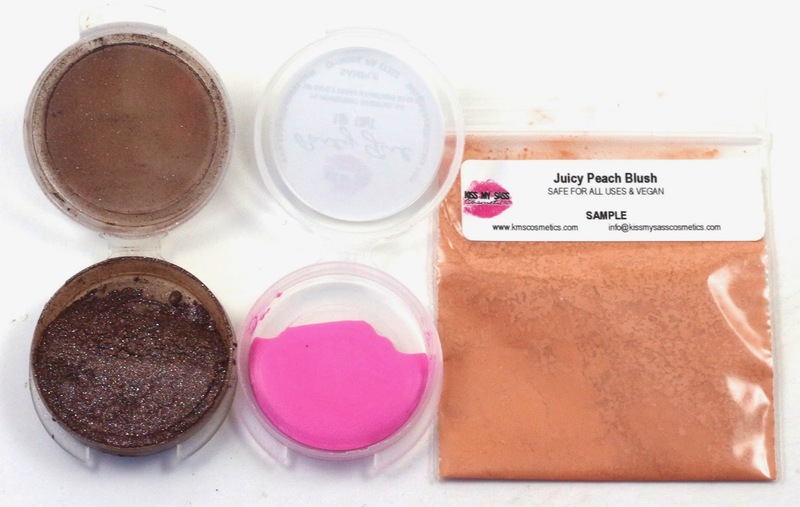 You can definitely see the rainbow of sparkles in this shadow, and I think this could work well with some of the other neutrals I received in this package. Kiss My Sass Lip Tint in Party Girl - "Cool toned pink"
This lip tint was just that, mostly a tint. It wasn't very pigmented, but instead gave a subtle wash of color. 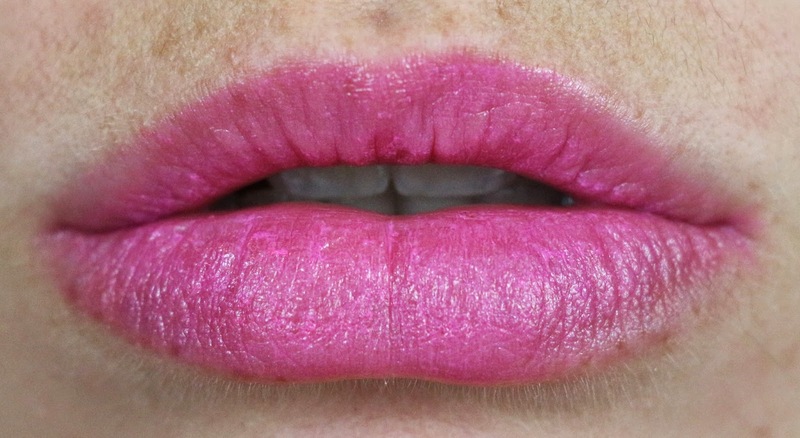 It did cling to the dryness of my lips, but otherwise it's a perfect Barbie doll pink. 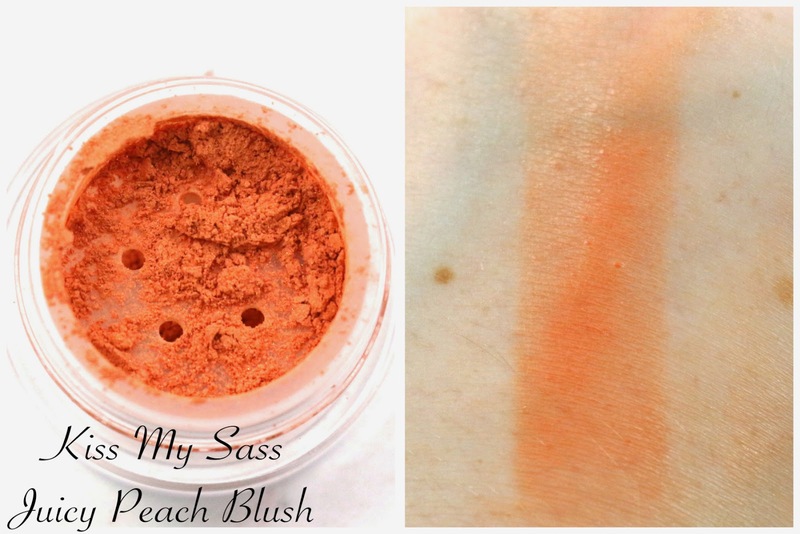 Kiss My Sass Juicy Peach Blush - "A juicy peach with a pretty glow." 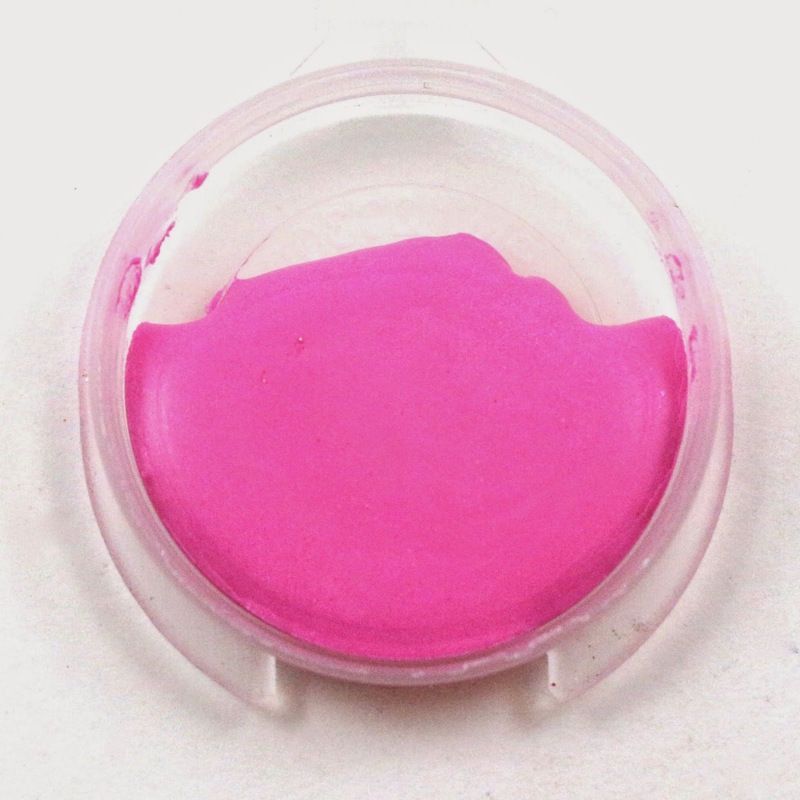 Sometimes I have a hard time using the lightest hand for indie blushes, they are usually so pigmented. But I think if you can master it for this shade, it would look great on a lot of skin tones. 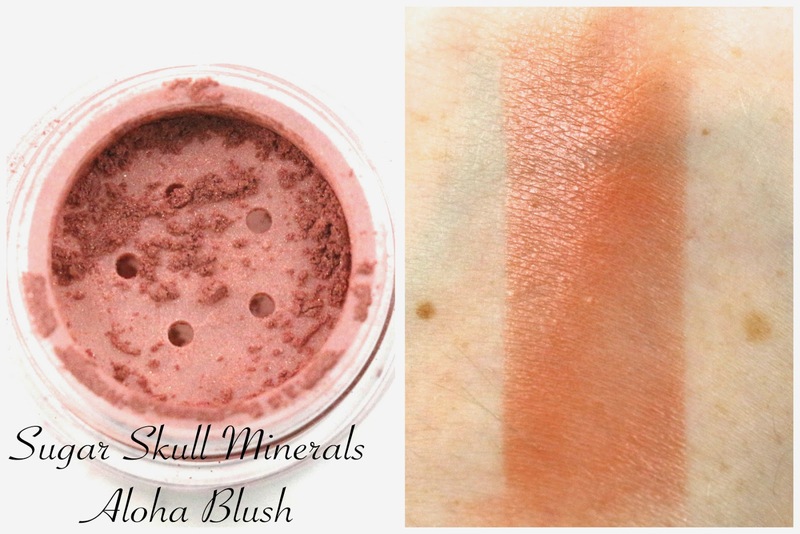 Sugar Skull Minerals Aloha Blush - "Mauve/coral blend with minimal gold reflects." This blush leans a little more orange than I had thought, but with a light hand, I think it would look very pretty. 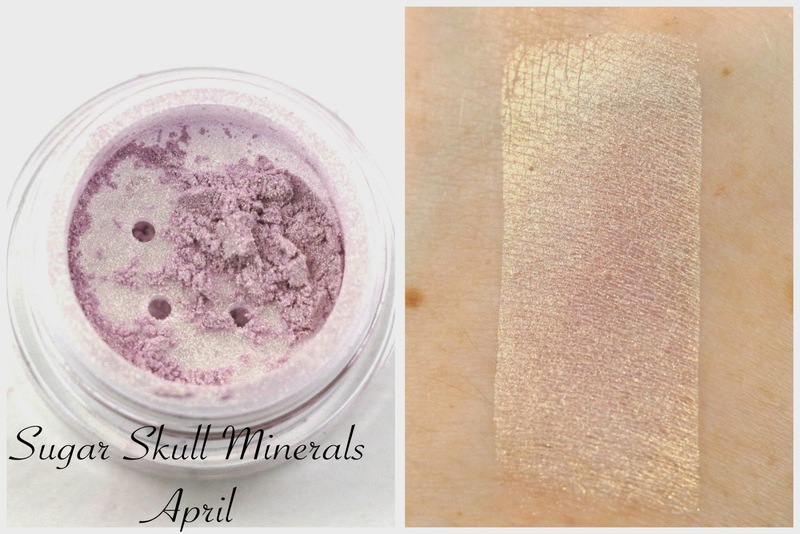 Sugar Skull Minerals April - "Matte light pink with a shifting gold highlight." You can't see the pink a whole lot in this shade, so I think it would work great as just a highlight shade. 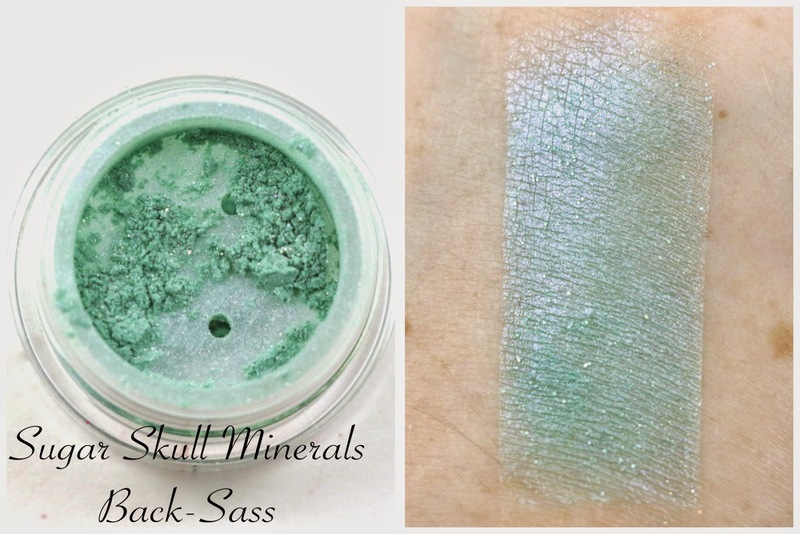 Sugar Skull Minerals Back-Sass - "Minty pastel green with violet duochrome and holographic glitter." I love the mint green shade of this shadow, I don't have any others like it I don't think. But I love the duochrome and this is a very pretty shade. 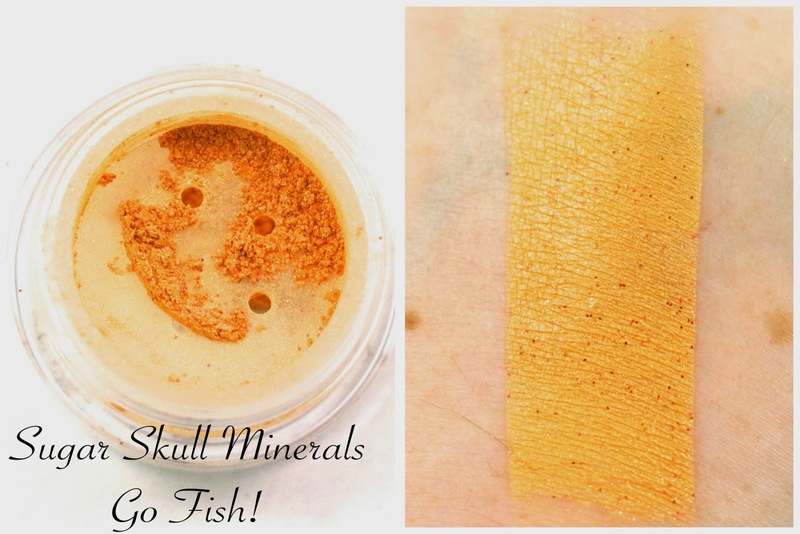 Sugar Skull Minerals Go Fish! - "Vivid orange with gold sheen and orange glitter." I didn't realize until swatching this that it has fairly large orange glitter! I love the play on the glitter looking like fish scales, and the name of this shadow. Very creative and original. 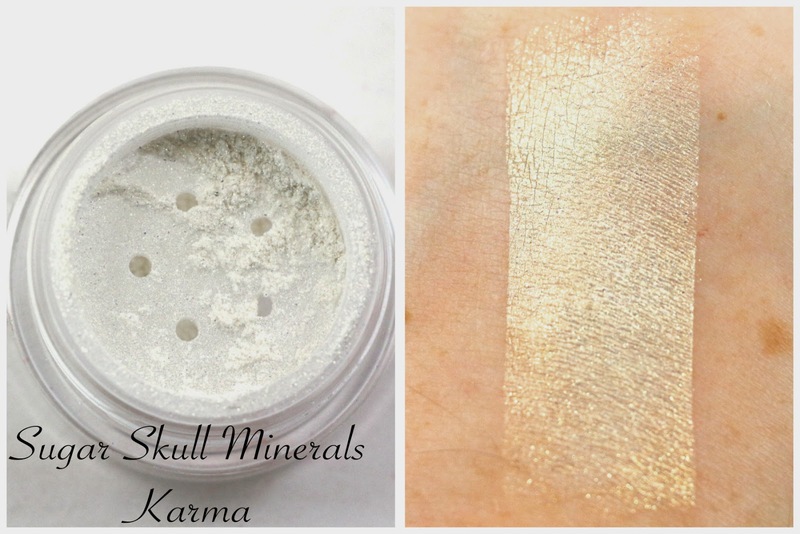 Sugar Skull Minerals Karma - "Golden yellow highlight with chartreuse reflects." This would be a good highlight shade paired with maybe a gold eyeshadow look, but it might be too warm for my skin tone. 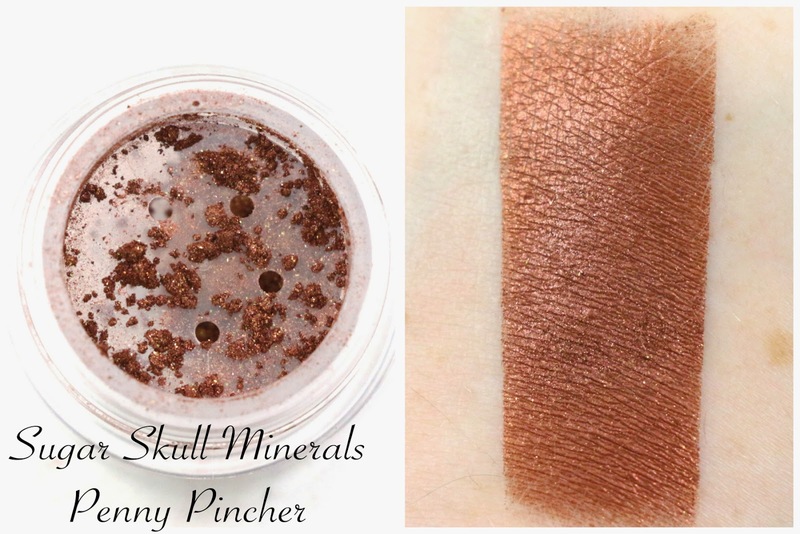 Sugar Skull Minerals Penny Pincher - "Shimmery copper with burnt orange reflects." One of my favorite shadows of the bunch from Sugar Skull, I love the name, and I love the shade. It's just such a perfect copper color of a penny. 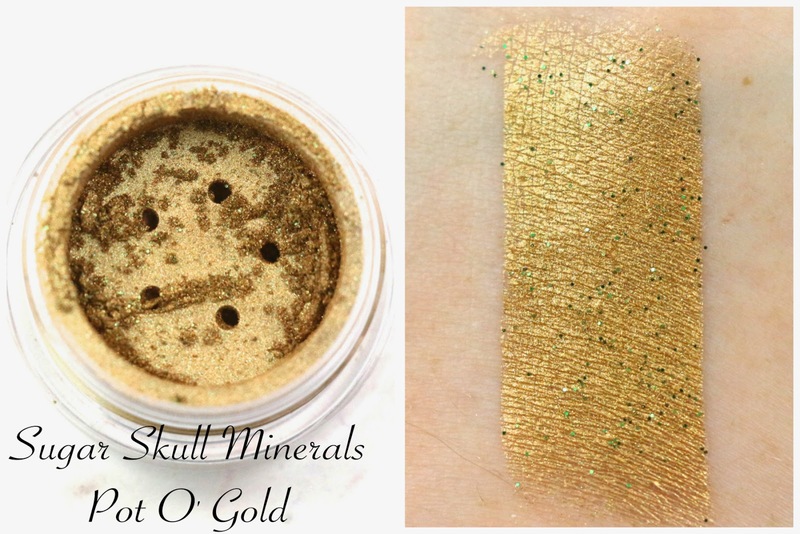 Sugar Skull Minerals Pot O' Gold - "Metallic gold with a slight copper base and green reflects." The same with this one, I didn't realize there was green glitter until I swatched it, and it's such a great shade for St. Patrick's Day! 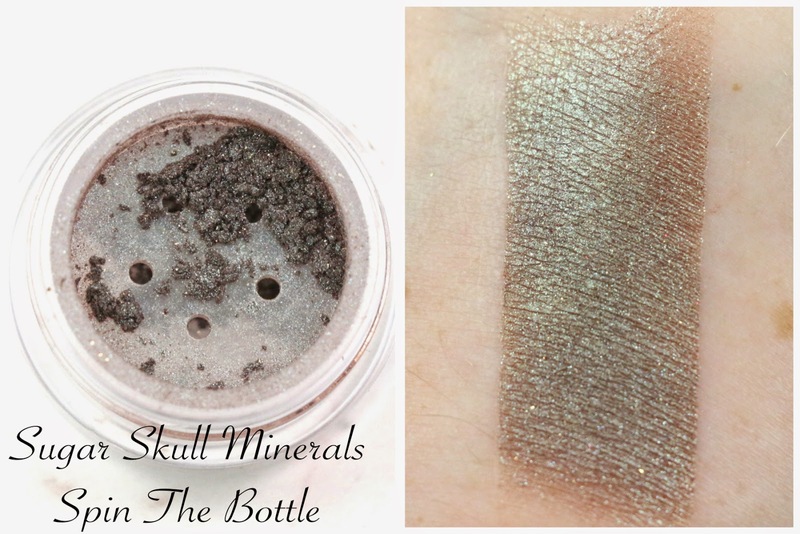 Sugar Skull Minerals Spin The Bottle - "A complex duochrome. A taupe/purple/brown base with blue/teal/green shift as well as copper/gold glitter." I have a few duochromes similar to this one, so it's not too unique. But I do think the shift is a little more prominent in this shadow. 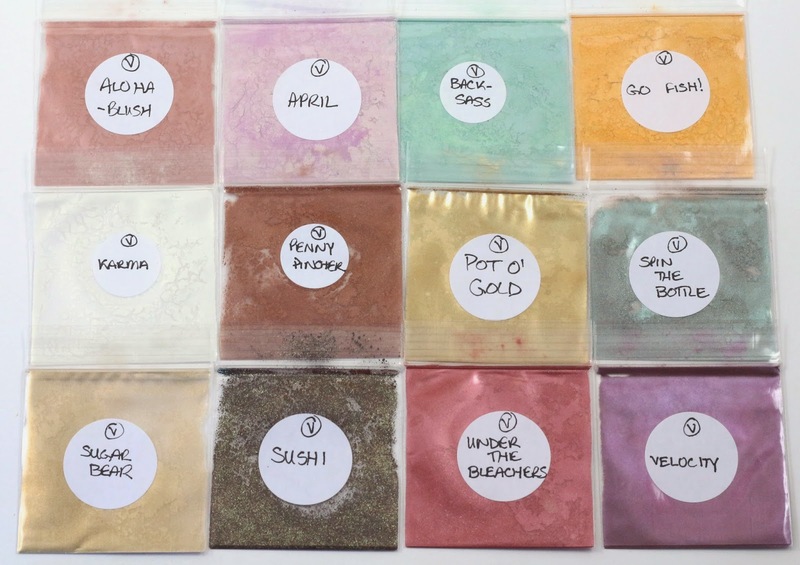 Sugar Skull Minerals Sugar Bear - "Neutral gold with pink shift as well as tons of gold and copper reflects." A very light wash of neutral, would be very good for a professional neutral look. This photo is from my Glamour Doll Eyes October OTM review, but I used the shade Sushi wet as an eyeliner. 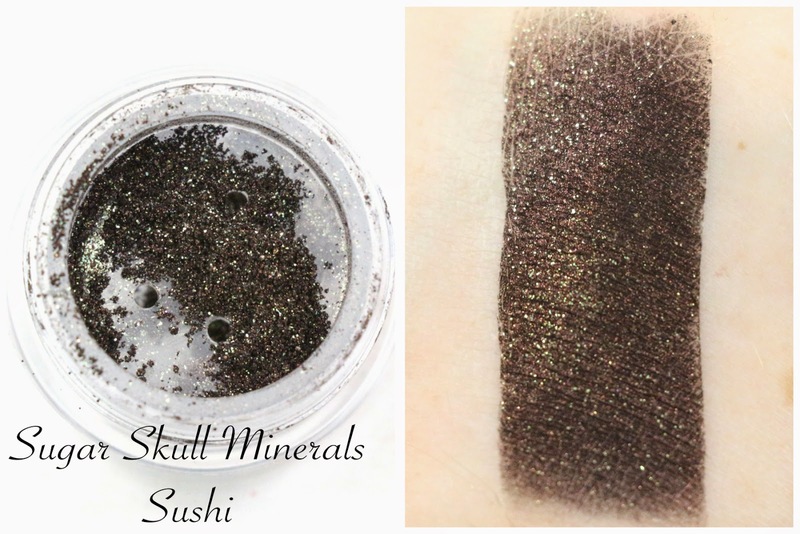 Sugar Skull Minerals Sushi - "Matte black base with red sheen and lots of chartreuse reflects ." 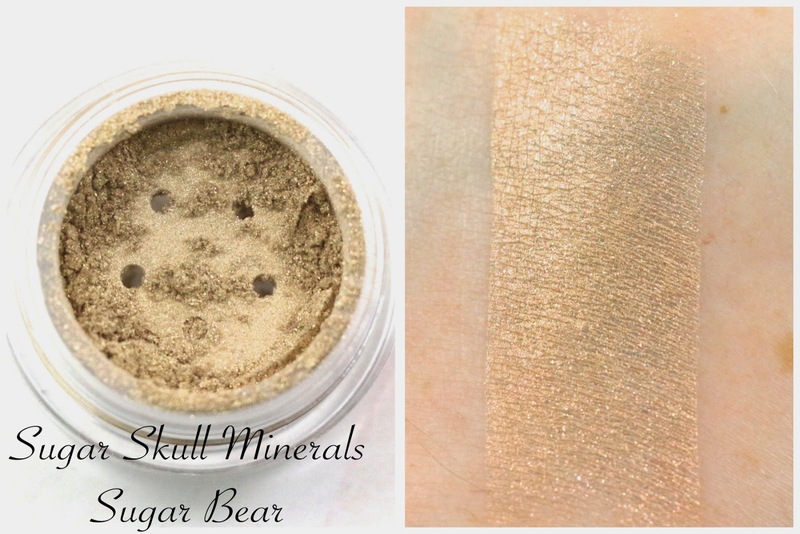 One of my other favorite shades I received from Sugar Skull, I don't have many black with glitter shades, so this one would look great turned into an eyeliner, or for a very glitter smokey eye. 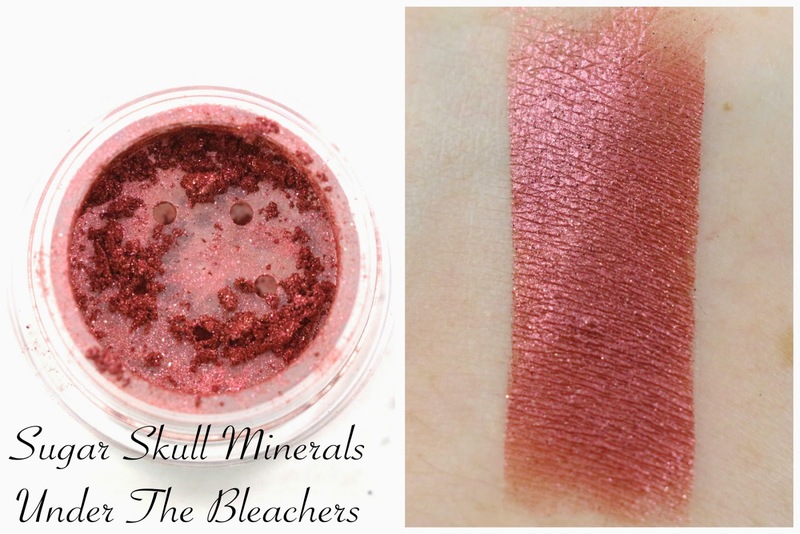 Sugar Skull Minerals Under The Bleachers - "Highly metallic ruby red with rose and gold reflects." I had imagined this would be a darker color, but I actually love what it swatches as. I could imagine wearing this for a Valentine's Day look, paired with a darker red, or a lighter pink. And I love the name of this one as well. 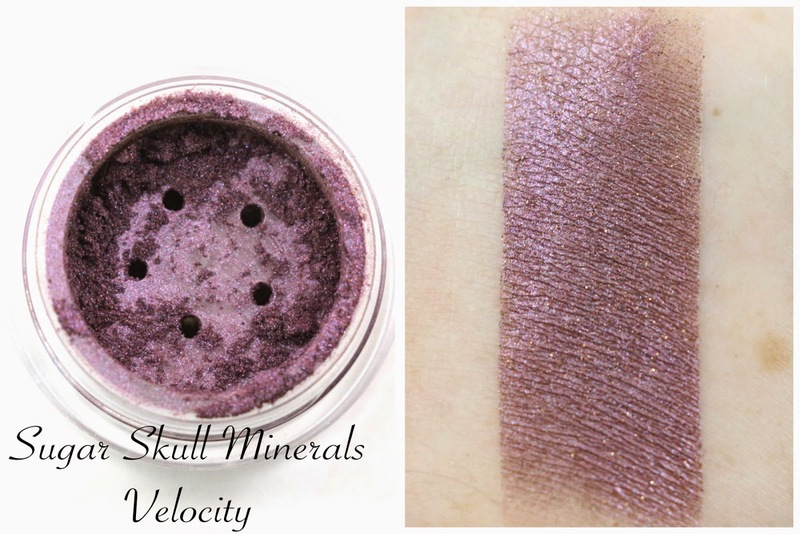 Sugar Skull Minerals Velocity - "Purple with mauve undertones with indigo and peach reflects." Another purple! Man, we all picked out a lot of purple eyeshadow! Not that there's anything wrong with that, but I like this particular one. The sheen and glitter in it is very pretty. 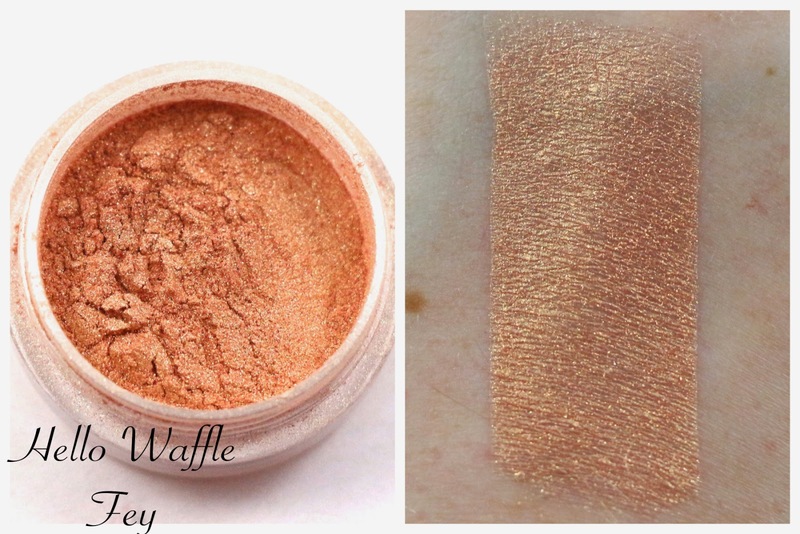 Hello Waffle Cosmetics Fey - "Shimmering golden apricot with rosy undertones." This is a really great neutral and one of Hello Waffle's most popular shades. I can see why, it would be great for a neutral eye. 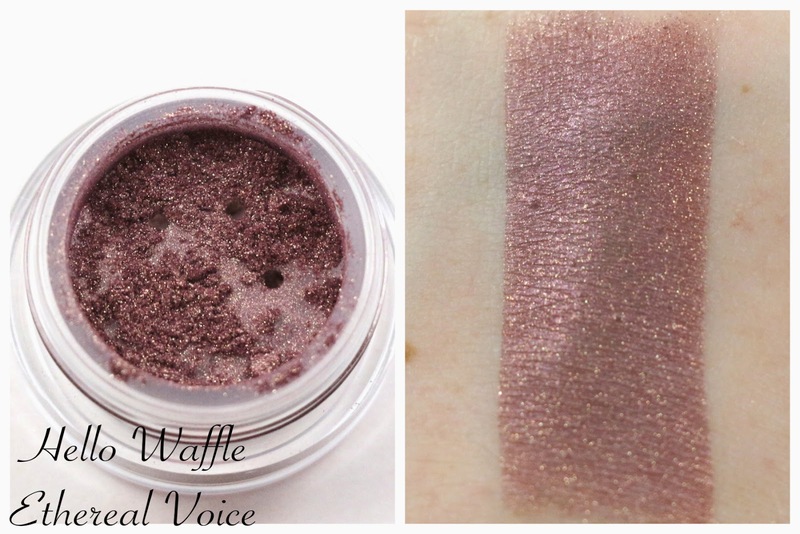 Hello Waffle Cosmetics Ethereal Voice - "Warm purple with noticeable golden shimmer." Most everyone received this shade, but because I already had it, I got the shade Lust instead. 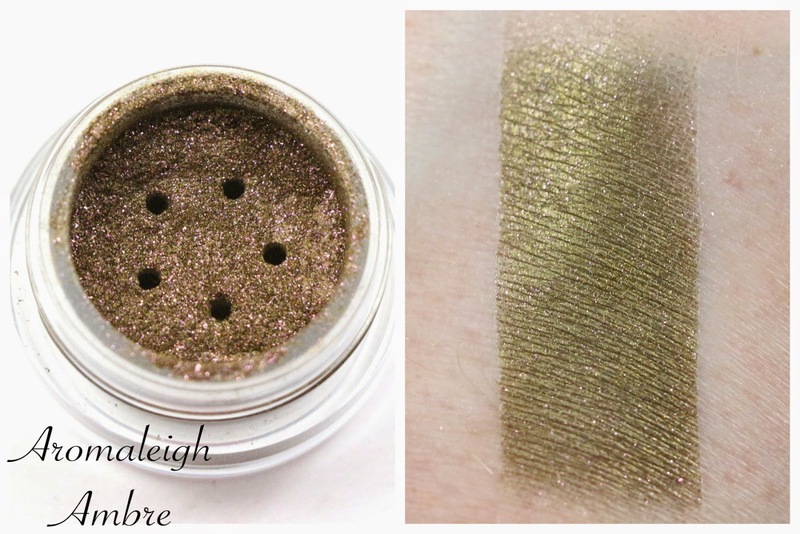 This is another of Hello Waffle's most popular shadows, it looks very beautiful paired with a neutral, like Fey. Here's my subtle neutral look with Hello Waffle Fey on the lid, and Ethereal Voice in the outer corner. 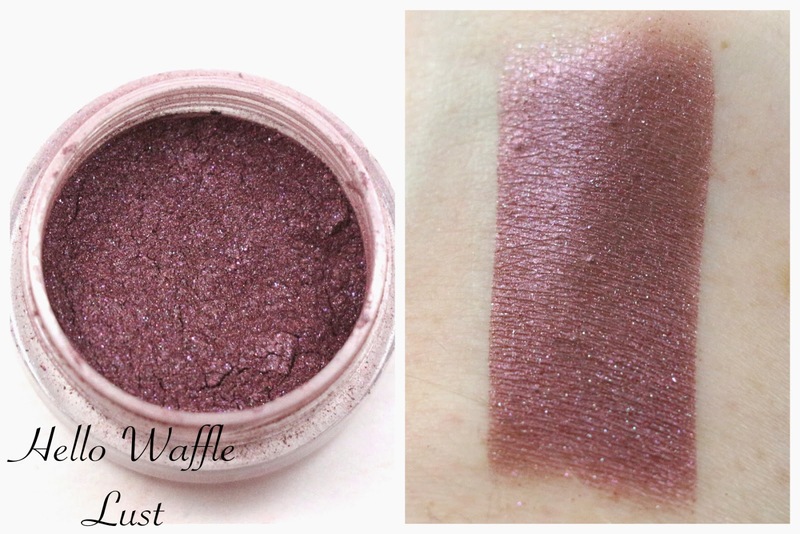 Hello Waffle Cosmetics Lust - "Dark berry with purple and blue shifts." This was the shade I received because I already had Ethereal Voice. It's definitely a cooler tone, darker shade than Ethereal Voice. But instead of the golden shimmer it has blue glitter. 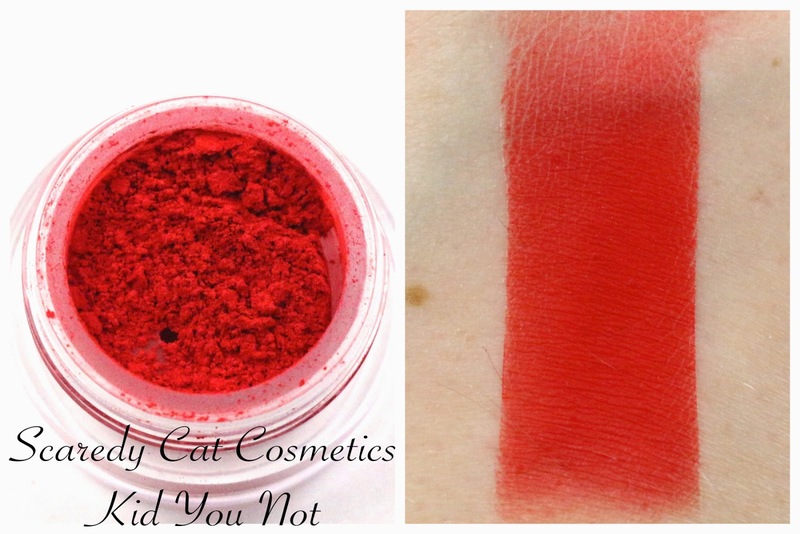 Scaredy Cat Cosmetics Kid You Not - "Intense matte red with micro shimmer." This shadow is starting to intimidate me! I know of the kind of look I want to do with it, but I just don't know if I can pull it off without looking like I'm bleeding lol! It's not quite dark enough to be what I would consider a wearable look, and it's matte so that makes it even more difficult. I do know that a red eyeliner is coveted by some, so this might be great for that. I will try a look, we'll see what happens. I wanted to try and do something really dramatic and crazy with this red shadow, so I came up with this little number. Great for Halloween or if you get turned into a zombie! 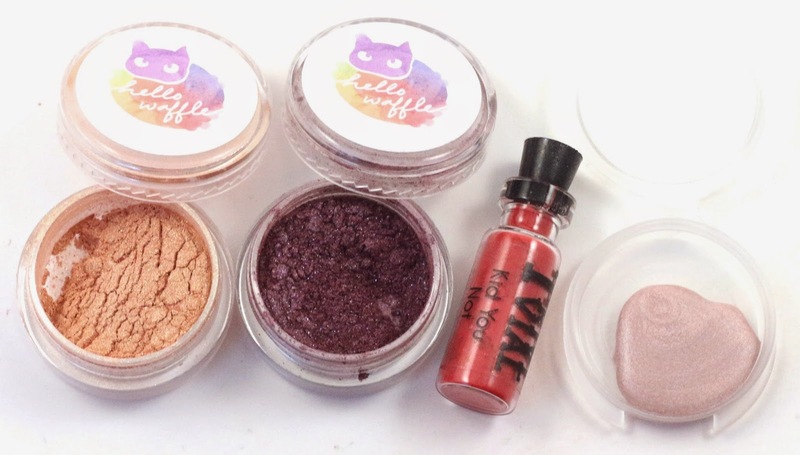 Scaredy Cat Cosmetics Kid You Not, Sugar Skull Cosmetics Sushi, Geek Chic Cosmetics Gotcha!, and shake it all up and here's the look! Geek Chic Cosmetics Gotcha! in the center of the lid, and the brow highlight, Scaredy Cat Cosmetics Kid You Not in the crease, inner corner, and lower lid, and Sugar Skull Cosmetics Sushi in the crease over Kid You Not. Kiss My Sass Cream Highlighter Honeymoon - "Light silvery pink"
How did I ever live without this? This is the perfect highlight I've been looking for! I admit, I'm not big on highlight for my face, but for a brow and inner corner highlight? This is absolute perfection, and using just your finger to do the brow highlight allows you to blend it easily with the crease color, and I just used a small brush to get this in the inner corner. You can see it in the Aromaleigh look I did earlier in this post. 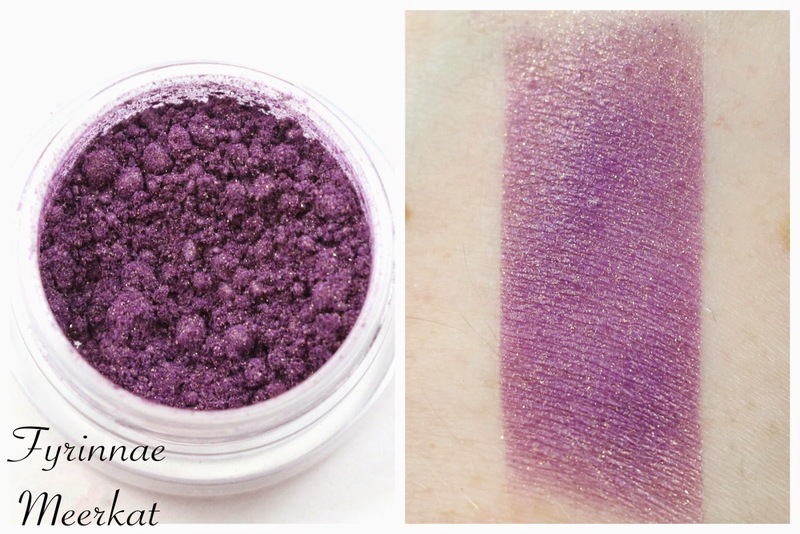 Fyrinnae Meerkat - "Vibrant pink-purple with gold shimmer and sparkle highlight." I was a little surprised by the texture of Fyrinnae shadows, as this is my first time trying anything from that brand. It's almost like wet sand, and it clumps a little, and packs nicely. None of that is bad, and I know they are known for shadows with that texture, I just didn't know when I was swatching this. But this is another pretty purple shade, brighter than some of the others but still with the golden sparkle. Lalalita Body Co. Lick My Lips Butter Pecan Lip Balm - "Simply put: here's the scent of fresh brown sugar. Think of baking cookies, and pies cooling in a windowsill; the rich, warm scent of autumn; pecans tossed in brown sugar and given to you in a paper bag." I like this lip balm, it's not quite as soft and moisturizing as some of the others I use, but I like the flavor, and I've decided to just keep this one next to my lightbox for when I'm taking photos, as I didn't have one there at the ready yet. 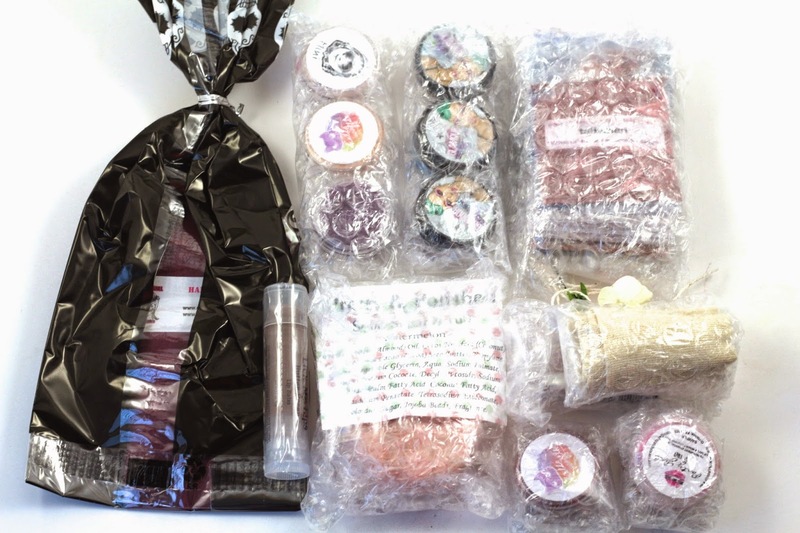 Overall, I loved everything in this package, and I'm so glad I got to try products from brands I had never tried before, and even some I hadn't heard of. And I love that even though almost all of us picked a purple eyeshadow (we all have good taste! ), they were all different and unique. And there was still a ton of variety among the items we chose, and personalization. Plus, a lot of the shades will work together well to create some great looks. I think if I were to do this another time, I would probably focus on picking out more perfumes and bath and body items for everyone. I think we all gravitated towards eyeshadows because they tend to be the cheapest items, and we were able to get more for our $5-6 per person. But I might go perfume, bath and body, and lip products. 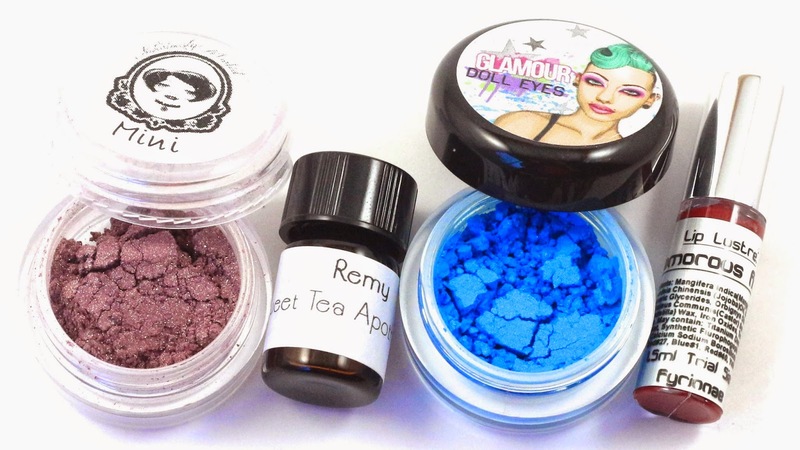 The stand out favorites for me were of course the items I chose, the Sweet Tea Apothecary Remy perfume, the Fyrinnae Lip Lustre, Sugar Skull Minerals Penny Pincher and Sushi shadow, and the Kiss My Sass cream highlight. Those are the items I would probably buy again, or buy a full size of! What did you think of the Indie Potluck? Let me know in the comments!